ISC V3.1 Rear Adjustable Control Arms. Control arms are a suspension component responsible for connecting the suspension to the frame of the vehicle and allow for your tires to travel up and down. Control arms keep the wheels in line with the car’s body. They are often overlooked yet serve an immensely important purpose. They also allow for a proper camber adjustment and alignment setting. 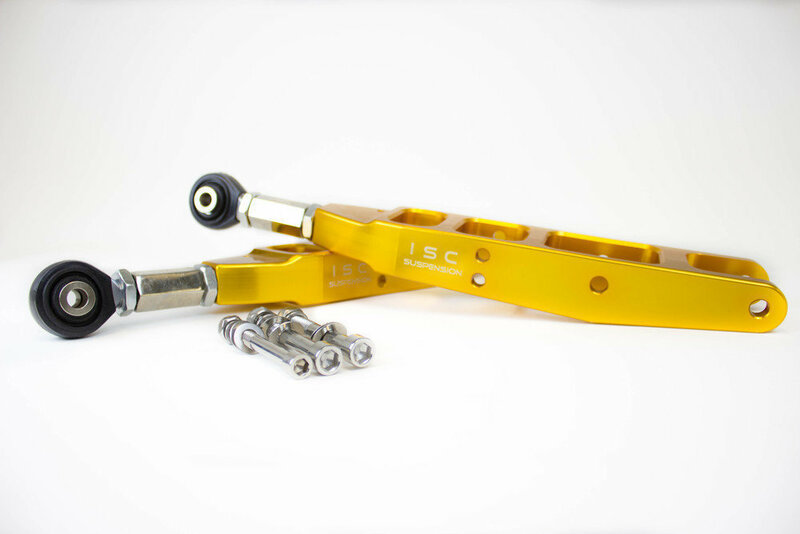 ISC has recently released our version 3.1 rear adjustable control arms. Fitment includes WRX/STi Sedan/Hatch/BRZ/FRS models from 2008+. – CNC 6061 aluminum allows for no welds and creates a much stronger control (6 times stronger than OEM hardware) arm while reducing weight. – No one else in the market offers the “Street Seal” – This allows our control arms to be more durable. There are a few signs to watch for that will help you determine if your control arms are on their way out – which will give you an excuse to upgrade :-). If you hear clunking or rattling when going over bounces, this is a sure sign that something is wrong and you should have your suspension system examined. Too much play in the wheel is another sign that something in your suspension system is failing and likely be your control arms. Lastly, if you feel a wobble in the steering wheel as you approach higher speeds, this is a common symptom of control arms failing. If you own a 2008+ and lowering your vehicle on coilovers or lowering springs, these adjustable arms allow you to obtain the correct camber settings and produce a functional alignment while maintaining the stance you want. Our logo is engraved into the arm as well for a sharp cosmetic appearance. These rear adjustable control arms are designed to be easily adjustable and durable for a lifetime of hard cornering and suspension abuse. The V3 control arm also now features 2 mounting points for rear endlinks, providing even more aftermarket solutions.